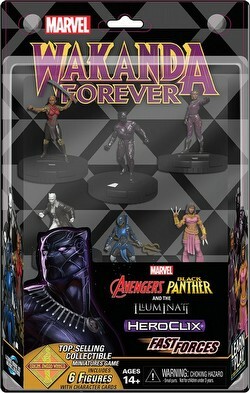 Celebrate the release of Marvel HeroClix: Avengers Black Panther and the Illuminati with a new Fast Forces set featuring characters of Wakanda. Look for Ayo, Black Panther, Nakia, Okoye, Shuri, and White Tiger to represent Wakanda in this exciting new Fast Forces release. Wakanda Forever! Once a player already has a Starter Set, a Fast Forces is a great way for them to construct a thematic team and build their collection!